QUEENS — The building housing a long-time and prominent Rego Park synagogue is slated for demolition, raising fears that the congregation, which has more than 1,000 people, will have no place to go. The worries came despite assurances from new landlord Rudolf Abramov of Trylon LLC that the displacement of Ohr Natan Synagogue would be temporary and the congregation will be allowed back once the new building is completed. The news also comes after the congregation poured more than $2 million into a 4-year-long renovation of the historic former Art Deco Trylon Theatre. The group's rabbi, Nahum Kaziev, said he fears that despite the developers' pledge, the congregation may not be allowed to return. Kaziev also said the displacement during the construction period would last a couple of years. "Where are we going to be in the meantime? On the street?," said Kaziev. “It’s unbelievable, it’s a shame." The 25,000-square-foot property, located on a triangle-shaped lot between Queens Boulevard, 99th Street and 66th Avenue, was sold in December 2012, for $9 million, according to Eugene Kim from Massey Knakal, a real estate company, which facilitated the sale. 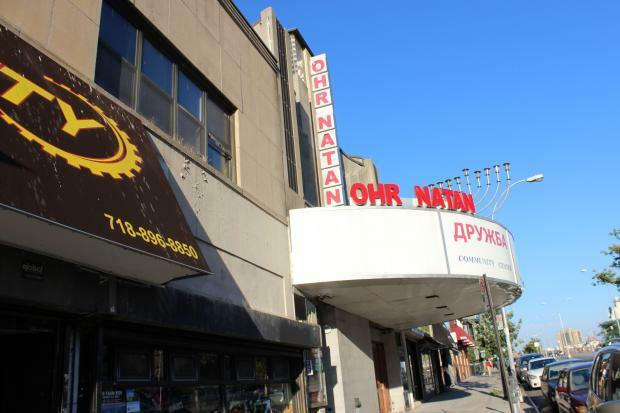 The new owners are planning to replace the existing complex — which includes Ohr Natan, one of the largest Bukharian Jewish centers in the area, and many other businesses, such as Tower Diner and a bike store, Spin City Cycle — with a residential building which will sit atop a two-story commercial space. Abramov added the property won’t be demolished anytime soon. “We are talking about years and years away,” he said. "They said they were going to give us two stores in the new building," Kaziev said, but the space would be much smaller than the current center, which is about 11,000 square feet. The congregation was founded 27 years ago, renting small spaces at first, including a basement in Rego Park. With an influx of Russian speaking immigrants to the area in the late 1980's and early 1990's, the congregation grew significantly and needed a larger space, Kaziev said. Eleven years ago they took over the deteriorating Art Deco-style Trylon Theatre, which opened in 1939 and closed six decades later, Kaziev said. The congregation invested more than $2 million in the 4-year long renovation before moving in, Kaziev said. He said the center also offers lectures, counseling, English and citizenship classes. About 100 children attend its after-school program and 480 families depend on its weekly food distribution program, Kaziev said. “Many people from the Bukharian Jewish community would be devastated [if the synagogue was displaced],” said Lilianna Zulunova, 29, a community activist and member of Community Board 6, who lives a few blocks from the center. Kaziev said that after the property was placed on the market for sale, the synagogue tried unsuccessfully to buy it. Local elected officials also expressed their concerns. “Its presence is long established in the community and would be disheartening to see it relocated,” Koslowitz said. Queens Rep. Grace Meng, who called the synagogue “a pillar of the Bukharian Jewish community in Queens," said she is "working with Rabbi Kaziev, local elected officials, and neighborhood leaders in order to best advocate for their needs."